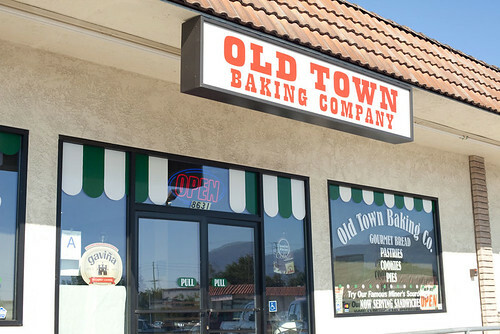 I’m not sure if I should call the part of town where Old Town Baking Company is at, Old Town Rancho Cucamonga or maybe more accurately the part of Rancho Cucamonga where they decided to not upgrade. Though I guess if you call your bakery “Old Town Baking Company,” I guess it is Old Town. Also if you don’t know the city of Rancho Cucamonga, that’s alright. Even though Bugs Bunny tried to get there many times, he seem to never get there by always making the wrong turn. Rancho Cucamonga is in San Bernardino county which is next to Los Angeles county and the famous Route 66 runs through it. The city decided to upgrade itself with chain restaurants and Starbucks to attract people into buying houses there. While it had cloned itself to look like any other cities in LA, some parts of Rancho Cucamonga were left untouched and I am thankful for that. Old Town Baking Company, like many shops in LA, sits in a strip mall with more than enough parking slots. 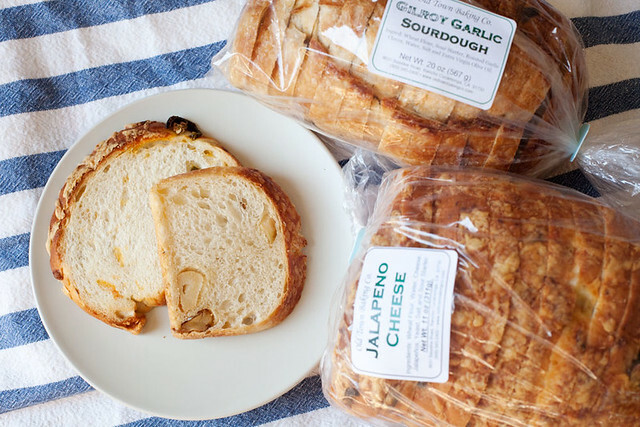 Even before walking into the bakery, I was able to smell the sweet scent of freshly baked breads. I walked in to find a big counter space with all of their breads, pre-sliced, displayed and all you have to do is point to what you want. In the back was an opened kitchen where workers were busily making more breads. I couldn’t resist getting just one loaf so I got two, garlic bread and jalapenos & cheese bread. The breads were nice and soft and still slightly warm. The garlic bread, after a nice toast in the oven filled the room with delicious garlic smell. But the clear winner was the jalapenos & cheese bread. The more than enough jalapenos gave it a REALLY GOOD kick and the cheese gave it a slight salty flavor. A good breakfast item I created was a jalapeno and cheese sandwich stuffed with bacon marmalade french toast! They also offer sandwiches with any of their breads.